We moved through the Rhode Island-based production, and then things got really tricky. Due to production difficulties, the final film wasn't quite coming together in post; scenes didn't connect, and whole chunks were missing. 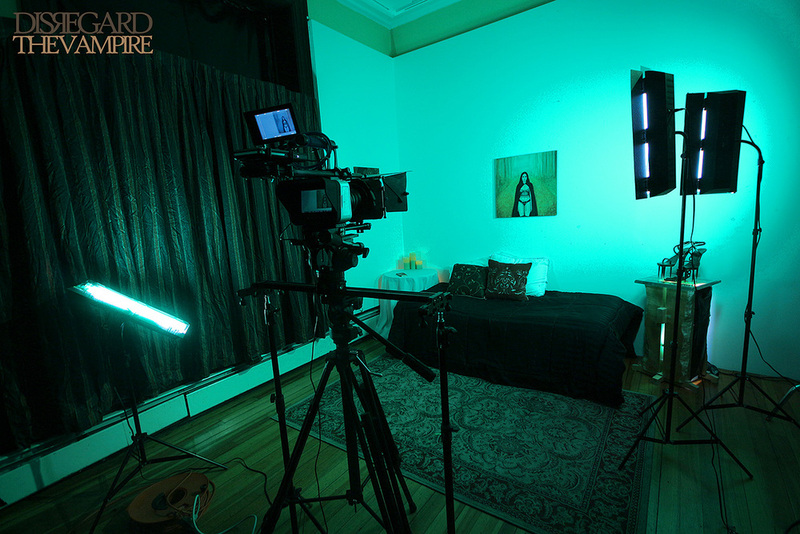 'The Green Room' on the set of Mike Messier's 'Disregard The Vampire' at Courthouse Center for the Arts in Rhode Island, 2014. Mike Messier and crew on the set of his film 'Disregard The Vampire' at Courthouse Center for the Arts in Rhode Island, 2014. I've recently had the pleasure - nay, privilege - to preview the new 'Disregard The Vampire: A Mike Messier Documentary.' Rather than document the making of this one film, Mike wanted to truly show the plight of the indie filmmaker, this new project highlighting multiple low-budget films he's ventured into over the years. In fact, you can read a recent article about Mike's indie filmmaking ventures on watchmymovietrailer.com. Why, who's that beautiful couple in the screenshot there? It's me and poet-musician John "Scorpio" Langis in our roles as Valentine and Cryptorr, of course! A trailer was cut to officially announce this new project, available below or directly on Vimeo.